EastWest präsentiert Voices of Opera, ein Instrument mit den sensationellen Vocals der Sopranistin Larisa Martinez (Andrea Bocelli) und des Tenors Carlton Moe (Phantom der Oper). Voices of Opera ist perfekt für jeden Komponisten, der seiner Produktion einen unverfälschten Opernsound hinzufügen möchte. Desweiteren passt Voices of Opera perfekt zu EastWests Kollektion preisgekrönter Gesangsprodukte Hollywood Choirs, Voices Of The Empire und Voices of Soul. Voices of Opera ist eine 40 GB große Sammlung aus Sustains, Staccato, Words, Legato und Phrasen mit den sensationellen Vocals der Sopranistin Larisa Martinez (Andrea Bocelli) und des Tenors Carlton Moe (Phantom of the Opera). Voices of Opera ist perfekt für jeden Komponisten, der seinen Produktionen einen unverfälschten Opernklang verleihen möchte. Larisa Martinez has established a strong and unique presence in the classical performance world. She’s currently performing with opera titan Andrea Bocelli as his principal soprano on his world tour. She is a winner of the Metropolitan Opera National Council Audition PR district 2016, where she also received the Angel Ramos Foundation Award and Audience Prize. She earned raved reviews as Musetta in Loft Opera’s critically acclaimed production of La Bohéme and for her other leading roles in Verdi’s Rigoletto, Gounod’s Roméo et Juliette, Rossini’s Adina, Floyd’s Susannah, and Donizetti’s Don Pasquale and Lucia di Lammermoor. Heralded by the New York Times as an “ardent tenor,” Carlton Moe is currently performing as Ubaldo Piangi in Andrew Lloyd Webber’s Phantom of the Opera, the longest running show on Broadway. His opera credits include Lakmé (Gerald), I Capuletti e I Montecchi (Tebaldo), The Mother of Us All (John Adams), Ernest Bloch's Macbeth (Malcolm), and Roméo et Juliette (Tybalt). He has also performed as a soloist in major works such as Verdi’s Requiem, Beethoven’s 9th Symphony, Mozart’s Requiem, and Handel’s Messiah. The same pristine recording techniques that make all of the EW products sound so rich and detailed went into the recording of Voices of Opera. Choose between multiple mic positions including Close, Rear, and Room. The close mic is a Telefunken 251 that gives you intense attention to detail. For the duet phrases, an additional Neuman U67 was used to fully capture the sound of both singers. The Rear includes a pair of vintage Coles 4038s that give off more warmth and space of the room. The Room mix includes a Decca tree made up of M50s and outriggers with a pair of AKG C12s, replicating the mic set-up of a classical stage. These are all vintage tube microphones that you cannot get your hands on anymore. All recordings were made at EastWest Studios, our world famous recording studios known for producing more Grammy nominations than any other studio in the world. Phrases: 36 full phrases and 84 sub-phrases from popular opera arias from the works of Verdi, Puccini, Mozart, Rossini, Bizet and more. There are 43 phrases and sub-phrases for Soprano, 40 phrases and sub-phrases for Tenor, and 37 Duet phrases and sub-phrases. Phrases were recorded in a few different transpositions, with each mapped to their respective root not positions that enable their use in a variety of key signatures. Sub-phrases, which are separate parts that make up a full phrase, can be switched using the Mod Wheel and are also mapped to their respective root note positions. 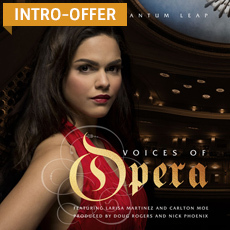 Voices of Opera is a must-have collection to add some vocal magic to your next project.